Nothing in the realm of thoughts or ideologies is absolute. Lean on one for long, and it collapses. Because of this, there is nothing more futile and frustrating than relying on the mind. To arrive at the unshakable, you must befriend the Tao. To do this, quiet your thinking. Stop analyzing, dividing, making distinctions between one thing and another. Simply see that you are at the center of the universe, and accept all things and beings as parts of your infinite body. When you perceive that an act done to another is done to yourself, you have understood the great truth. 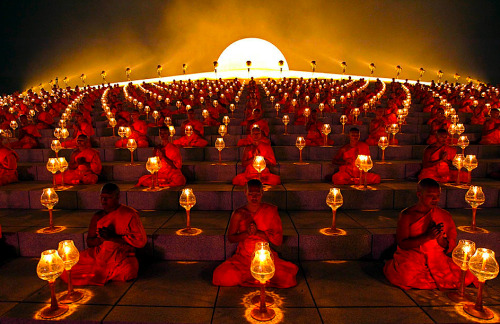 Today in Bangkok: Thousands of Buddhist monks chanted during a lantern lighting to celebrate Makha Bucha day, which commemorates Buddha’s first sermon on the essence of Buddhism.